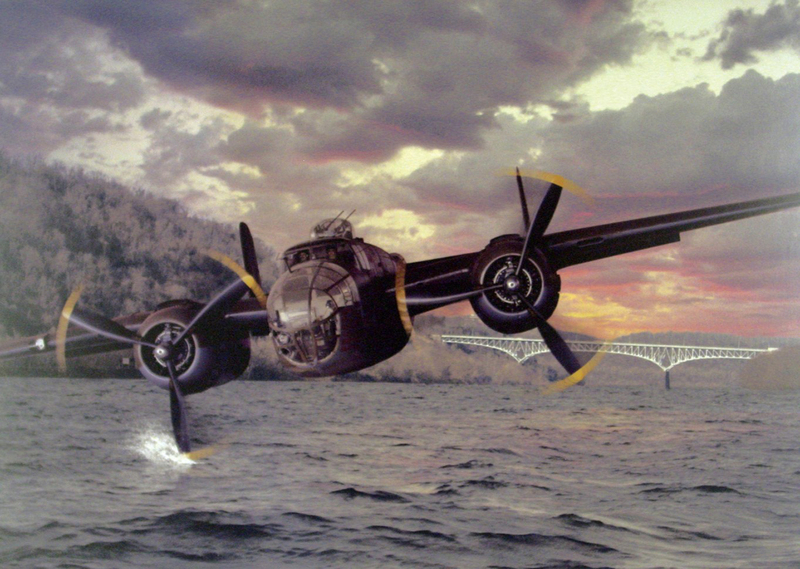 Illustration of the B-25 bomber over the Monongahela River. Courtesy of the B-25 Recovery Group. 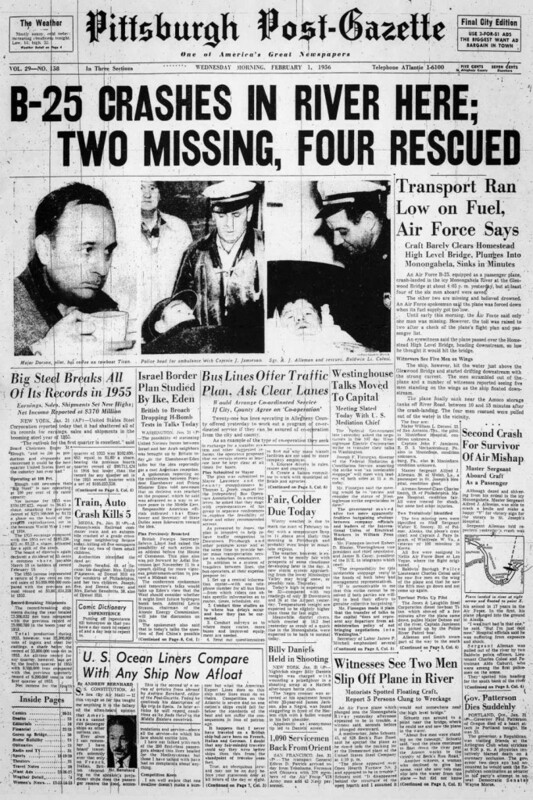 Sixty years ago, at the height of our nation’s Cold War frenzy, an American military plane crashed into an icy Pittsburgh river, sparking one of our city’s most interesting – and enduring – unsolved mysteries. On Jan. 31, 1956, Maj. William Dotson and five crew and passengers were flying over Pittsburgh on a routine training flight from Nellis Air Force Base in Nevada to pick up a cargo of airplane parts at Olmstead Air Force Base in Harrisburg, Pa. During the cross-country flight, the plane refueled at Tinker Air Force Base in Oklahoma and again at Selfridge Air Force Base in Michigan. At around 4 p.m. on Jan. 31, the crew reported a loss of fuel and requested permission to land at Greater Pittsburgh Airport. When Maj. Dotson realized their fuel wouldn’t last, he instead asked to land at Allegheny County Airport. At 4:11 p.m., with his fuel supply completely empty, his engine malfunctioning, and without any available airstrips nearby, Dotson was forced to make a hasty decision. As his B-25 Mitchell bomber glided silently over the Homestead High Level Bridge (today’s Homestead Grays Bridge), Dotson made a wheels-up splash landing into the Monongahela River near the Glenwood Bridge in Hays. All six crew members survived the crash, although only four were rescued from the 34-degree water. After floating with the plane for 11 minutes, the airmen found themselves in the icy water. Two men, Capt. Jean Ingraham and Staff Sgt. Walter Soocey, drowned while attempting to swim to shore, their bodies not found until months later. In the ensuing hours, a Coast Guard cutter – the Forsythia – snagged a wing of the submerged plane while dragging its anchor. But the line slipped and the B-25 slid to its watery grave, never to be seen again. The search efforts by the U.S. Coast Guard and the Army Corps of Engineers continued for 14 days but the bomber was never recovered. How does a 15-foot high B-25 medium bomber go missing in a 20-foot deep river? Several once-classified documents have helped to shed light on the B-25’s mysterious flight, but its final resting place is still unknown. Conspiracy theories abound. Some suggest the bomber carried dangerous or mysterious cargo and that the U.S. military secretly recovered the plane’s wreckage immediately after the crash landing to hide its true contents. Some believe the mystery bomber may have been carrying a nuclear weapon or even a UFO from Area 51 near Las Vegas. Many believe the highly polluted Mon River corroded the aluminum exterior of the aircraft decades ago, only the steel engines and landing gear remaining. 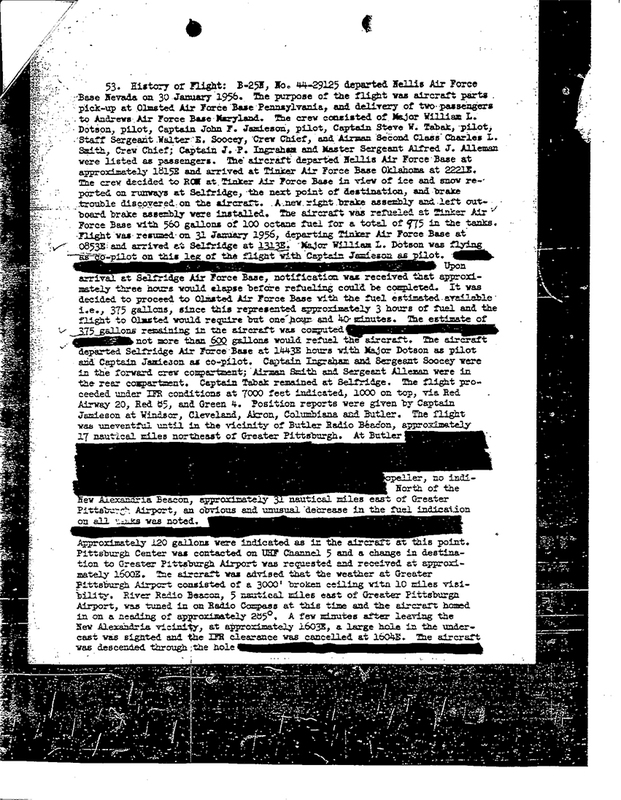 Others cling to cover-up myths that range from the plane carrying Soviet agents to Las Vegas show girls destined to entertain senators in Washington, D.C. In more recent years, a team of volunteers known as the B-25 Recovery Group worked with the Heinz History Center with the hopes of locating the lost plane. Despite extensive research, sonar scanners, and remote-controlled cameras, the Recovery Group found no evidence of the plane during several attempts. To this day, the “Ghost Bomber” remains one of Pittsburgh’s most famous unsolved mysteries. The History Center’s B-25 “Ghost Bomber” collection includes newspaper clippings, documents, photos and film related to the crash and subsequent search efforts, and the official accident report, eyewitness accounts, and video of the Recovery Group’s efforts. For more information, contact the Detre Library & Archives at the Heinz History Center. Font page of the Pittsburgh Post-Gazette, Wednesday, Feb. 1, 1956. Courtesy of the Pittsburgh Post-Gazette. Missing B-25 bomber report. Courtesy of the Detre Library & Archives at the Heinz History Center. To see more pages from the report, please refer to this PDF. I remember hearing a theory that it ended up going down into the Wisconsin River that flows below the other three. Wiconisco Creek is a tributary of the Susquehanna River in Schuylkill and Dauphin counties, Pennsylvania, in the United States. It is approximately 45.5 miles (73.2 km) long. It’s located over 250 miles East of Pittsburgh. I cannot find a Wisconsin River South of Pittsburgh. TB-25N serial number 44-29125 did NOT refuel at Selfridge AFB. The official document used to illustrate your article clearly states this. Before it was fully submerged and before it sank to the bottom it drifted downstream with the currents. No part of the plane would have been visible as it drifted beneath the surface prior to eventually ending on the bottom of the Ohio river. It could be miles downstream from the impact point. Especially if the plane crashed oncoming or adjacent to the river’s flow, but i’m not sure how likely the plane crashing adjacent to the river’a flow I see even possible, depending on the size of the river. It would not pass the first set of Locks and the dam at Emsworth. And we wonder why we can’t find a missing Malaysian Airliner in a big ocean! Approximately 45 years ago, my brother, who was a young truck driver at the time, heard an older truck driver tell a story at J&L mill about how he and a few other truck drivers were asked that night of the crash to help haul the bomber out of the Monongahela and were advised that this was a matter of national security. At the time my brother related the story, my father expressed doubt that the crash ever happened, but agreed that if that if the older trucker’s story was true, it would explain why the wreckage was never found. I, too, have heard of people who say there were witnesses that saw the plane being recovered during the night. There is no way the plane could have sank into the Wisconsin River. The Wisconsin River is not an actual river as we know it, but is what geologists refer to as the Wisconsin Glacial Flow. Glaciers were coming and going in the Northern Hemisphere about 2.5 million years ago. By about 798,000 B.C., they had advanced into Pennsylvania, moving through cycles of advance and retreat every 100,000 years or so. As they retreated, miles of ice melted and sent torrents of water cutting into the landscape, carrying huge amounts of sand and rock with them, Jones said. “As the melts slowed, they lost their ability to carry lots of sediment, and so lots of sediment sort of gets stranded in the valley floor in kind of random piles,” he said. Downtown, the North Side, the South Side — all those long, flat areas on either side of the river that became the bedrock of industry, hearth and tradition — weren’t divined by good planning, but built on sand. Some people have mistakenly dubbed this water supply “the fourth river,” as if you could rent a kayak and shoot through a hidden cavern. Legend has it that the Point State Park fountain draws from its estruary. That would be cool, but it’s not true. The fountain runs on treated city water and the fourth river is really just 50 feet of sand and gravel on top of rock. Yes there is an actual Wisconsin River its headwaters come out of a lake in Northern Wisconsin and empties into tbe Mississippi River near Praraie Du Chein Wisconsin. My father was working at Masta Machine. He saw this land also saw it recovered that night. He was working a double. I have tried to give my dads story but nobody seems to want to here. I will be glad to share his testimony as it was a story he told several times. If you or your father would like to share your story please reach out to me pintsandpuzzles@gmail.com I’d love to hear other perspectives right from the source! My grandfather was a master machinist who also worked at Mesta Machine and I remember hearing him tell stories of watching that plane ditch in the river. This is an intriguing incident that could become a fantastic thriller – I worked with bob johns one of the key investigators of this event and spent much time discussing scenarios and evidence – quite interesting – we will see what we will see —- maybe ???? I’m considering raising money to fund finding it. I’m looking for the non profit that originally put effort into finding it so we didn’t waste time on things already done. I’d love to work with them but am having a hard time having calls or emails returned. Any contact info for any members of that group would be appreciated. It’s a shame the show fact or faked isn’t still on. You could probably submit this to those guys. I would love to see something come out of it. But however, I agree with the currents, it’s probably down here in Wheeling somewhere by now. Or drifted elsewhere in the Ohio River by now. Does anyone remember the Jaques Cousteau expedition on the river from Wheeling to Clairton. Found nothing. I seem to remember hearing rumors that it was recovered and taken through J@L Steel in Hazelwood. Col. William Dotson, pilot of the B-25, died on April 20, 2016. He was my daughter-in-law’s paternal grandfather. Rachel was very familiar with the “30 Seconds Over Pittsburgh” legends, through both her father and grandfather. Col. Dotson never admitted that anything was unusual about the flight — he apparently rarely if ever discussed it. So the mystery of what really happened — how a decorated WWII combat pilot could misjudge the amount of fuel in his plane — will never be solved. Rest In Peace, Col Dotson!!! Eugene, It would be fascinating to hear more about your Dad’s testimony. C’mon. A big plane in fairly shallow water? Of course it was recovered. Who knows why all the secrecy but the plane had to have been removed early on. I really don’t know if this has anything to do with this story or not but I know a place of employment that I have worked had a huge metal building and then had another huge metal building built inside of that one,that had an airplane that was tore completely down for investigation this place is in Washington County Pennsylvania again I don’t know if it has anything to do with it or not, but it may just add to the mystery. Enter your email address to receive the latest blogs from the History Center directly in your inbox.